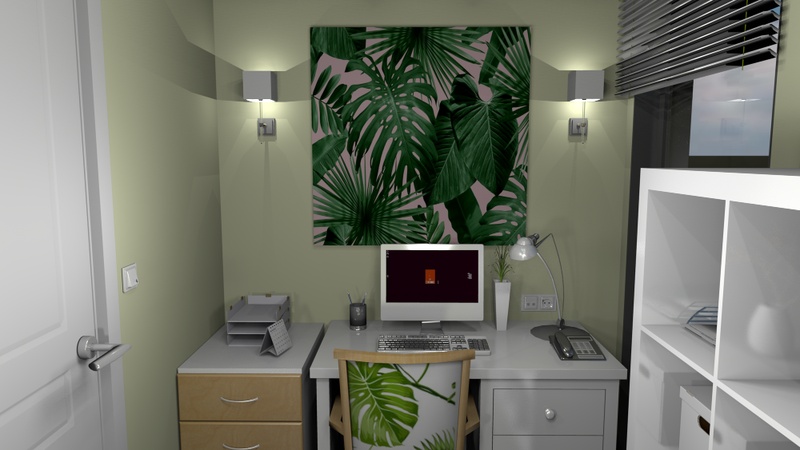 I was missing from the forum for a lot of time, but recently I started creating a home and here I will post two rendering of the small office in it. Open for suggestions, especially suggestions about on how to render realistically because it took me a lot of time to set up the lights for these renderings but I do not enjoy the results. Here is a view of the desk. Here is a view of the office, especially the library. Your project is impressive. I can see you paid a lot of attention to details. The ceiling lights are cool. From my experience - sconces on the wall are rather difficult to make them look emitting light realisticly. So what exactly you don't like, can you be more specific? Your project is impressive. I can see you paid a lot of attention to details. The ceiling lights are cool. From my experience - sconces on the wall are rather difficult to make them look emitting light realistically. What I do not like in particular is how light is reflected over some objects, and I think that if I start changing the properties of each object it will be an infinite work to reach a good result, I may try. Anyway I think that I have many things to learn about the rendering process of sh3d, there is something that I am missing. For example, all the properties in the advanced renderings window are not clear enough for me so usually I did not use them but I think that there is a way to setup better options for rendering. Anyway, yes it is a Kallax cabinet; I really like its simplicity and I am sure that in my future office I will use it because of its comfort for easily find things and the possibility to decorate it with plants (as in the renderings). Oh yeah, I know exactly what you mean. When using silk shader there is no other option than to modify manually each material of the object with the glossiness slider, not only the object as the whole. The gloss shader is even worse as it seems to produce "an instant mirror" on everything that has glossiness set to any other value than fully matt. Anyway I still think you cope with reflections skillfully. A tip: from my experience - when rendering modify the strength and position of the light sources with regard of camera position for each shot to avoid bad reflections. Don't count on "universal" lights config that looks good from any angle. It doesn't work like that. 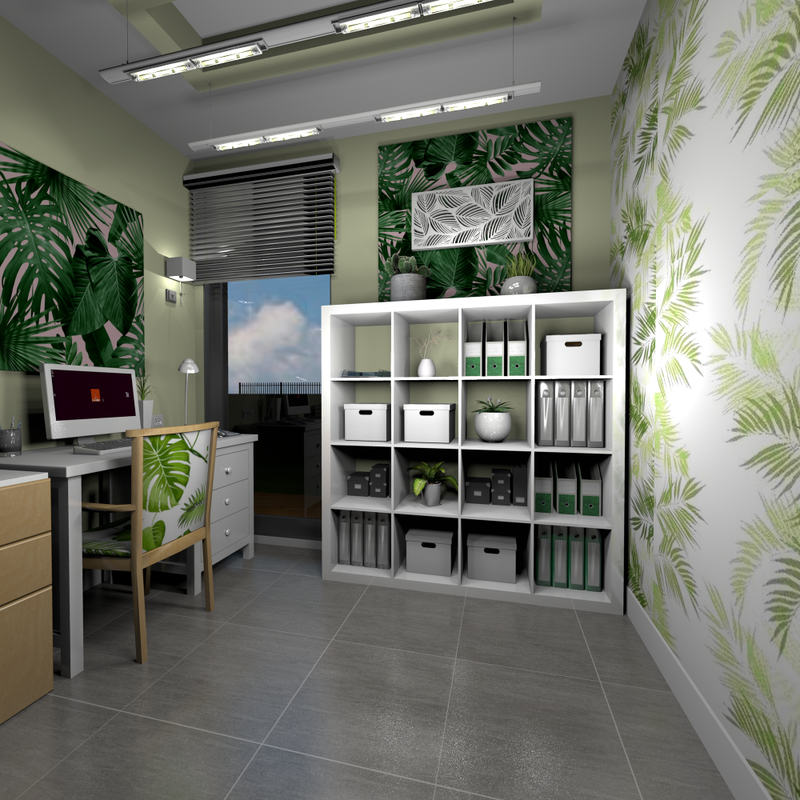 Hi AdeleAlli, very good renderings and a really nice office environment, as to lighting suggestions, there is a little too much light getting into the cabinet for realism as it should only appear to come from the ceiling lighting, same for the light patch on the right hand wall of the 2nd image. If you use enkonyito's light sources to illuminate the ceiling and room you can achieve good results, just be aware that they do create a shadow line around the room, this can be cancelled out by elevating the down facing source slightly above the up facing source. I have a feeling Aeowyn will like this room. Your suggestions are about the second image, right? both the light getting into the cabinet and the light patch on the right hand wall. The problem is that I used some light sources in order to make visible the objects in the library, because if I do not use any they stay in shadow, I know it is normal but I wanted to make them visible. Anyway I will try to modify the lights and post something later on. enkonyito's light sources are good and I tried to use them, especially the light panel, but I was not able to use it in the right way. I tried to use it for the ceiling light giving it the dimensions required by that lights but I was not able to understand which was the light direction, I am inexperienced with them, I know. Maybe enko can give me some suggestions on how to use them in a proper way :). What I can say more is that they have only one illuminating face for them to be properly managed by Sunflow. This is symbolized by the light indicator in the plan and by the visible side with diagonal or opaque face in the 3D view when the light panel is selected. These markers must be used to orient the light panels. Thank you Enko. I already understood that and I tried to resize the light panels in order to match the ceiling lights, but what happened was that the light was very weak, even if I set it at 50%. Can the problem be the fact that the panels are very tight and long? Yes Adele, the brightness of the panels is related to their surface. At equal light power, a large panel will illuminate more than a small panel. OK, thank you. In these days I made some other tests about them but unfortunately I did not find a right configuration yet, but I will try more, because in the renderings I posted some time ago, I used the led lights that are default models in sh3d and the result imho is bad because there is "space" between the actual light sources on the ceilings, it would be better if I can use the light panel that you created in such a way to obtain a continuous light source. I will try until I not succeed :D.